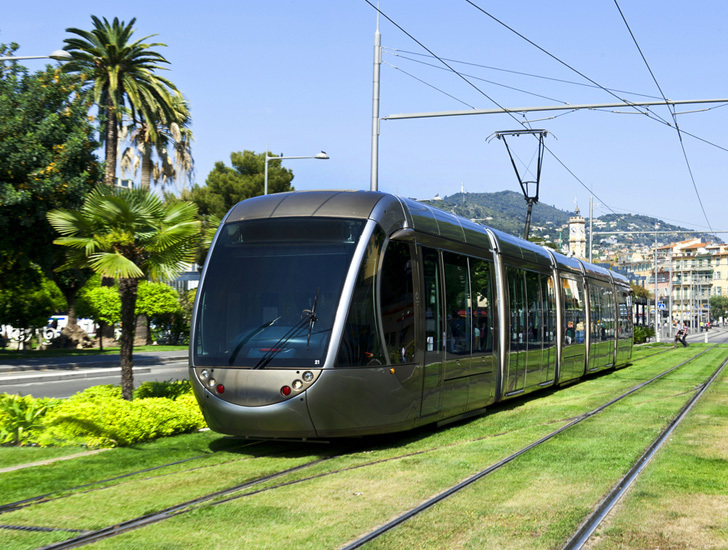 Although it's certainly not a new idea to combine landscaping with public transportation, we love the sight of these European trams gliding along on beds of grass. From Barcelona to the Czech Republic, Frankfurt, St-Etienne and Strasbourg, these public transit greenways are showing the potential of incorporating landscaping into good urban design. Much like green roofs, these swaths of green provide a host of benefits to any urban area, like reducing urban heat island effect, providing a permeable surface for storm water to infiltrate, and reducing pollution. And did we mention that it looks so much prettier than concrete or asphalt? We wish the public transportation in the US looked this good. Check out the New Orleans streetcar lines. It would be good to acknowledge the good U.S. examples! This is really a good idea -- whether it is a new or old idea is not important. What we need to do is to promote this approach more...including in many rapidly developing and modernizing Asian cities.. Perception is everything. Browning of the grass is a problem from the public perception side of things, as many folks seem to think that wehn the grass is brown it is dead. It is not, it is only going dormant. I'm all for a "green tracks" approach to rail design, but in areas where we have very hot and dry summers as here in Baltimore, MD, we need to educate the public on the reality of what it can/will look like, and the associated maintenance required to keep it looking "acceptable". Sedums may offer a similar aesthetic gain, and would still be a "green soulution". Irrigation is never an option, especially on public projects using State and Federal funding, but "green tracks" can help with a reduction of impervious surface and urban heat island. Muito bonito... realmente diferente! deveria ser copiado por outros países. This is very nice! However I do wonder how they avoid the soil getting onto the rails and making the trams lose traction. Certainly in the UK the entire rail network seems to grind to a halt every time there is a leaf or a snowflake somewhere between London and Dundee. Abo Says: so what?… we have had (in Ukraine) the stuff like this since USSR was… this is not a new idea Yes, the idea is new. The fact that you had green tram lanes in the Ukraine was probably due to the fact that the USSR, in those days, was seriously lacking maintenance. Since many of these are located in climes that get snow, I assume they've figured out how to remove snow. That on top of the mowing and care issue may balance the urban heat island dissipation and permeability. I think the US could go a long way towards meeting the grade by having stormwater management integrated into whatever new light rail/trams that are built. That way maintenance costs are lower and the benefits are greater. 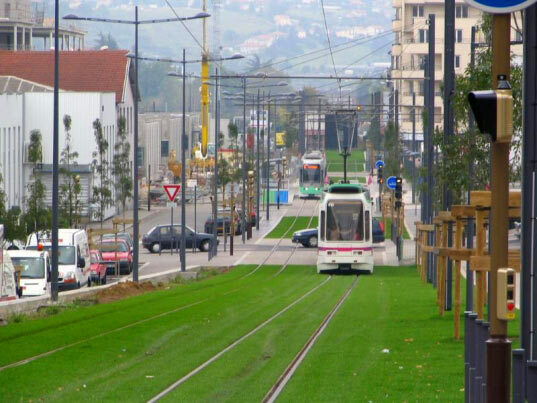 I live in Bordeaux , France and we have some parts of the tramway on grass. And there is a problem : water. Bordeaux has considerably decreased its quantity of water used for urban gardens so, during summer, the grass is completely dry and yellow. It's not always as lovely than on these pictures. But i prefer that, so we use recycled water or no water but today we also have to think about it. Sorry for my "frenched" english. The US really needs to invest in public transportation. Not only is adding grass a beautiful thing to do, I love reading about the benefits it provides beyond its surface beauty. There are varieties of grass that are very hearty and do not require much mowing. As far as when it dose... you could have a cutter that is part of the tram... as for the other areas.. electric mowers do just fine on maintained lawns. such a classic approach. I would imagine this is also more quite than cement. Great post, I wish we had tramways like these in Hungary as well! Integrate the reel type lawn mower onto the front of the train/tram. They have had this in New Orleans since 1835. I was just wondering about the mowing issue..and the possible fertilizer/pesticides to keep them so very green. I do hope that it's really green..all the way to the roots. they look amazing, i visited the http://www.oway.com.au office in sydney recently and they have incoperated landscaping into their office, it looks and smell fantastic. Who's going to cut all that grass? I bet it costs more than concrete in the long run. Tell me that's some variety of grass that doesn't require mowing! If it does, and they use two stroke mowers to do the job, then all the benefits are basically nullified. They started with this last year also here in Berlin, Germany. More about the global renewable energy soloutions is been presented in my 'Book of Synergy' (sorry, recently only in German: http://www.buch-der-synergie.de). They reduce urban heat island effect, provide a permeable surface for storm water to infiltrate, and reduce pollution. And did we mention that it looks so much prettier than concrete or asphalt? We wish the public transportation in the US looked this good. Monocle says: "Where possible, this attractive combination of efficient public transport and inspired landscaping should be standard as part of the urban fabric."